On Sunday, Grammy-nominated rapper, community philanthropist and entrepreneur Nipsey Hussle was shot and killed outside of his Los Angeles clothing store. As a Los Angeles resident, I can’t even begin to describe what he meant to this city. But a host of friends, fans and collaborators of South Central’s own have taken to social media to express how much he meant to each of them. Prior to taking the stage last night at Lollapalooza Argentina, fellow California native Kendrick Lamar paid tribute to his fallen friend by requesting a moment of silence. And by displaying a jersey and a pair of sneakers inside their locker room. Trans activist Raquel Willis wrote about “the complexity of mourning people with anti-LGBTQ+ pasts” for Out Magazine, while also taking the time to publicly express her condolences. The most emotional reaction came from Compton rapper The Game, who shared his disgust and frustration with “the streets” that stole Nipsey’s life. 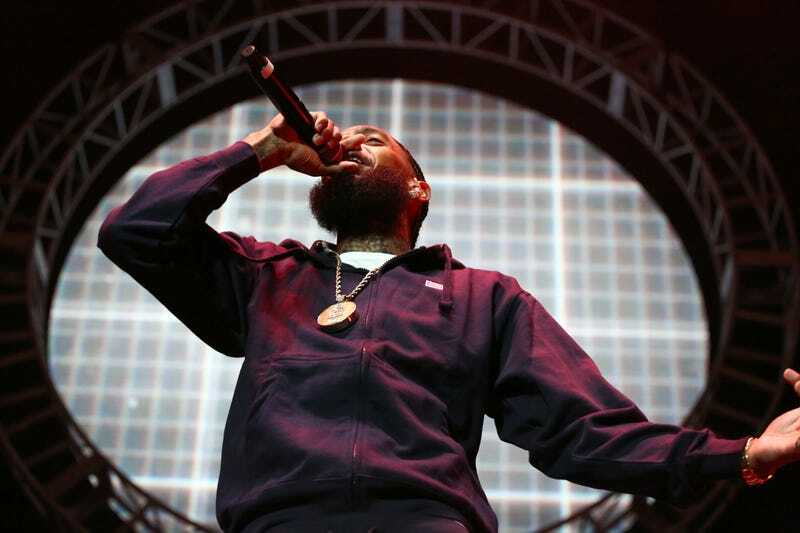 While no arrests have been made yet, authorities believe the murder was carried out by someone Nipsey knew. The rapper, entrepreneur and community activist is survived by his two children, Kross and Emani Asghedom, and his fiancée, model and actress Lauren London.